Spurs took part in the first semi-final against Red Bull Brazil who had beaten Glasgow Rangers with a late goal to overtake them and finish second in their group. Red Bull:� Daniel; Urias, J. Silva, Rosa, Feitosa(Figuieredo 35); T. Silva, Veloso(Martinelli 38), Reis; Ferreira, Junior(Bocchio 40+2) + 1 other? Spurs went into the game as top scorers and on a high, but were brought down to earth by a Brazilian side that were more professional. Our opponents were up for the match and sought to knock Spurs out of their playing style which worked. Spurs defended the East end in the first half and when Spurs had a throw in next to the Brazilian bench one of their players grabbed Roles to stop him taking the throw. When Roles pushed him away their players both on and off the pitch surrounded him. Roles suffered a few challenges after that which were uncalled for. I not sure if that affected our players but it did not show as they took the lead when Sterling pulled the ball back from the left for Samuel Shashoua to drive in at the near post. Up till then Red Bull had had a couple of efforts from distance but they began to take on the Spurs defence with pace. Junior played in Ferreira from the left channel to drive low into the corner of the net for the equaliser. Junior had an effort himself that went wide. Shashoua was still causing the Brazilians problems and he was fouled at the end of the half. Roles took the kick through a gap in the Red Bull defence for Sterlings curved run in behind. With only the advancing keeper to beat the Spurs striker curled it wide of the far post. There were no changes for the second period which saw the Brazilians take the lead and it was the same combination of players. This time it was a counter-attck from their half that caught Spurs short at the back and which saw Junior play in the pacey Ferreira to hit it on the run for his second goal. Spurs made a couple of changes with Griffiths replacing Dinzeyi as an attacking option and Armando Shashoua replacing Duncan in midfield. Red Bull again broke with pace with Meloso playing in Theo Silva who arrived unmarked to score the killer goal. 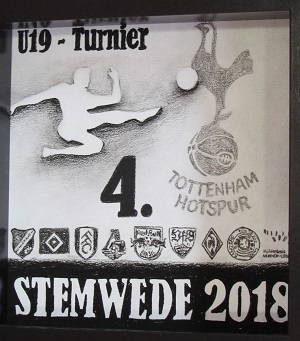 It was then just a matter of seeing out the game which involved breaking up the play and led to a tete-a-tete between Marsh and Junior which led to both players being booked - Spurs' first yellow of the tournament. Roles drew a save before Spurs won a penalty. Sterling was looking for space in the area for a shot and he was fouled by Reis who was booked. Sterling sent Daniel the wrong way scoring inside the left post. As Red Bull began to use up time making changes Tanganga drew a save with a low drive as he pushed forward. Austin still had to make a save from Rosa but time ran out and Spurs suffered their first defeat. Spurs met the other losing semi-finalist in the 3rd place play-off game. This was Werder Bremen who they had beaten 1-0 in the Group phase, and had hopes of beating them again. Having lost to Spurs in the last group match Werder Bremen were out for revenge and they set about the Spurs players to prevent their passing game by whatever means they could. It was like they were playing rugby with the amount of holding pushing and barging which was supposed to have gone out of the game. At one point Armando had the shirt taken off his back. I had been promised a squad photo before the game but the practice pitch was closed off and the warm up was on the pitch with the keepers and the starting players so the only picture I could get is the one printed above. Spurs lined up with Austin in goal behind Skipp and Tanganga with Statham at right back and Hinds on the left. Marsh anchored the midfield with Sterling and Amando Shashoua ahead of him. Griffiths led the line with support from Markanday on his right and Samuel Shashoua on his left. This was a more balanced looking formation than last time and was maybe what the Germans were expecting as they did a good job in stifling the play. Alves had an early header wide and Philipp fired wide in a poor first half which saw hardly any chances. The start of the second half was delayed as the assistant referee on the far side was being interviewed by the tournament reporter. The delay may have affected the Spurs players as when they kicked off they lost the ball and Quarshie run through to score. It was a soft goal to concede and Spurs never really recovered. Philipp fired over before Spurs made a double change. Roles came on for Griffiths to allow Sterling to go up front and Dinzeyi replaced Statham at right back. Spurs almost conceded again when Skipp headed onto his own crossbar before clearing the danger. Roles reacted to the intentions of Mbom which led to both players being booked. With Spurs pushing players forward they got caught out at the back when a long ball into the area found Philipp unmarked to score a second goal. Spurs made another change with Duncan replacing Marsh but Werder Bremen saw out the game leaving Spurs to finish fourth which was an improvement on last year's ninth. The final was a repeat of the last one with Red Bull again beating Fulham 1-0. As I had to leave to return for the last game at Wembley I missed the evening's presentations which saw Samuel Shashoua pick up the award for best player of the tournament.